CARSON, CALIF. (August 29, 2013) — The fight between former World Boxing Council (WBC) middleweight champion and Son of the Legend JULIO CÉSAR CHÁVEZ, JR., returning to the ring in his 2013 debut, and No. 1 contender BRYAN “The Warrior” VERA has been rescheduled for Saturday, September 28, and will take place at StubHub Center in Carson, Calif. The Chávez vs. Vera 12-round super middleweight rumble marks the first time Chávez has fought in the Los Angeles area since June 4, 2011, when he won the world title over undefeated interim world champion Sebastian Zbik. The fight will be televised live on HBO World Championship Boxing®, beginning at 10:15 p.m. ET/PT. Promoted by Top Rank®, in association with Zanfer Promotions, Banner Promotions and Tecate, remaining tickets to Chávez vs. Vera, priced at $200, $100, $50 and $20 (plus applicable taxes and fees), can be purchased online at www.axs.com, by telephone at (888) 929-7849 or at the StubHub Center box office, Monday – Friday, 10:00 a.m. to 6:00 p.m. Suites are available by calling (877) 604-8777. For information on group discounts, please call (877) 234-8425. Chávez Jr. (46-1-1, 32 KOs), of Culiacán, México, returns to the ring for the first time since his thrilling world title loss to Sergio Martinez on September 15. Their Méxican Independence Day spectacular was the highest-attended boxing event in the history of the Thomas & Mack Center, with 19,186, topping the record set by the heavyweight championship rematch between Lennox Lewis and Evander Holyfield, which drew 19,151 in 1999. He captured the WBC middleweight crown in 2011, winning a majority decision over undefeated interim world champion Zbik at STAPLES Center, just a few blocks away from where his father won his first world title, in 1984, at the old Olympic Auditorium, when he knocked out Mario Martinez to capture the vacant WBC super featherweight title. 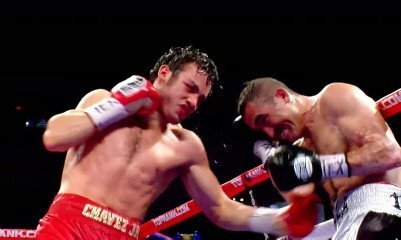 Chávez Jr. successfully defended his title three times, knocking out Andy Lee and Peter Manfredo, Jr. in the seventh and fifth rounds, respectively, and winning a unanimous decision over two-time world title challenger Marco Antonio Rubio. Vera (23-6, 14 KOs), of Austin, TX, who enters this fight having won six of his last seven bouts, is riding a 16-month, four-bout winning streak. Vera’s current hot streak includes NABO middleweight title victories over Sergio Mora, former world champion Sergeii Dzinziruk, and Donatas Bondoravas, the last two victories coming by way of knockout. Vera, who trains in Houston with Ronnie Shields, is currently world-rated No. 1 by the World Boxing Organization (WBO).